House Majority Leader Kevin McCarthy came under fire recently for comments the California Congressman made about Hillary Clinton’s poll numbers after the start of the House’s Benghazi panel. He may have been forced to walk back those comments for needlessly politicizing a very serious investigation, but for those keeping score he may have been technically accurate. The exact effect the Benghazi issue has had on Hillary isn’t fully clear, however, it is evident that Clinton’s approval rating has dramatically dropped since her time at the State Department- the number of Americans who view the former Secretary of State in a favorable light has plummeted and Clinton now faces record low poll numbers. She is even underwater with female voters, with nearly 50% having a negative opinion of her. A recent Fox News poll illustrates Clinton’s problems. Registered Voters ± 3% Pts. Democratic Registered Voters ±5% Pts. The Fox poll shows Clinton at a historic low. Clinton has been on a national roller coaster ride with her approval ratings ever since she first appeared as the feisty wife to then Arkansas Governor Bill Clinton. >>>Since then, Clinton dealt with her husband’s impeachment and the Monica Lewinsky scandal, among scores of others while in the White House. She ran for Senate from New York after leaving 1600 Pennsylvania Ave. in 2000, she ran for President in 2008, subsequently becoming Secretary of State after losing to Obama. After once enjoying sky-high poll numbers as Secretary of State, scandals like Benghazi, revelations from WikiLeaks, and now multiple investigations into the legality of her email system have ravaged Clinton-she’s gone from favorably viewed and trusted as one of America’s most popular politicians to freefall, viewed skeptically and in an extremely untrustworthy light. It’s not just Fox News polls that show Hillary in distress. 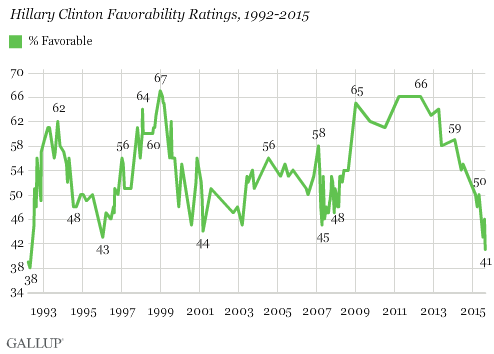 According to Gallup, Clinton’s favorable raring is at a near record low of 41%, with over half of voters seeing her in a negative light. “ Dogged by continued scrutiny of her email practices as secretary of state, Democratic presidential candidate Hillary Clinton’s favorability with the American public has sunk to one of its lowest levels in Gallup’s 23-year trend. 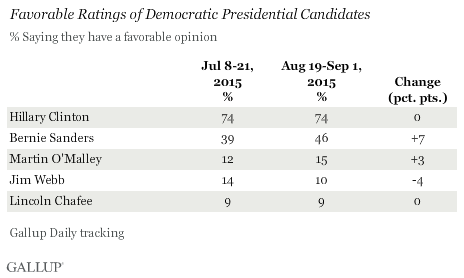 Currently, 41% of U.S. adults say they have a favorable opinion of the Democratic front-runner, while 51% hold an unfavorable view. Gallup also analyzed Clinton’s downward spiral since first bursting on the American political scene in 1992. “Clinton’s sub-40% favorable ratings in 1992 were mostly a product of the public’s lack of familiarity with her, rather than any kind of broad unpopularity. By contrast, her current 41% favorable rating is arguably her worst, given her nearly universal name recognition. Her present rating is about as low as it was in March 2001, during her first few months in office as a U.S. senator from New York. Perhaps more importantly, it was also after controversial pardons that her husband, President Bill Clinton, granted at the end of his presidency, and after the Clintons took furnishings and other gifts that were White House property when they left. More generally, since Clinton emerged as a public figure in 1992, her favorability peaked at 67% in December 1998 after President Clinton was impeached, and waned in the years thereafter — bottoming out at 44% after the Clintons left the White House. Her favorability improved somewhat during her time in the Senate, reaching as high as 58% in 2007, just after she announced her first bid for the presidency. Gallup also says that Clinton’s numbers may continue to flounder, possibly causing Democrats to look more seriously at Vermont Sen. Bernie Sanders, or even bring Vice President Joe Biden into the race. “As Clinton continues to field inquiries from the media and government into her email use as secretary of state, her favorable rating among national adults has fallen to near-record lows. But she remains generally liked among Democrats themselves, so it is still an open question as to whether media reports of her email situation will have an effect on her ability to obtain the Democratic presidential nomination.